Day 2: Ride: Hita to Yufuin. 60-70km. Rolling terrain with to big mountains. Shorter day but difficult. As an option we can drop off our bags at the Inn, climb Mt. Yufu and do some sightseeing in Yufuin which is famous for their natural hot spring baths (onsens). Day 3: Ride. Yufuin to Oita. City 60-90km. Rolling terrain. Big steep climb out of Yufuin over the back side of Mt. Yufudake. Crazy fast, fun descent into Beppu. Choose from a mountain or seaside route from Beppu to Oita. Day 4: Ride. Oita to Aso. 100km. 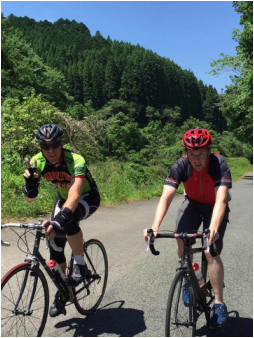 Hilly ride through the Kuju mountains and along parts of the famous Yamanami Highway to the town of Aso. Day 5: Ride: 60 km. The accent of Mt. Aso. Long, steep, epic climb to the top to view the steaming crater and visitors center. Enjoy a long, fast decent with your hair on fire to Minami Aso for lunch. Continue around the mountain and return to the town of Aso. Enjoy a hot spring bath before taking the train back to Fukuoka. Need we say more? This tour visits breweries, sake factories and Kyushu area watering holes. Depending on the season, winery tours and all you can drink beer gardens are available. Bottoms up!!! Day 1: 30km. Arrive in Fukuoka and check in to Hotel. Ride to The Hakata Hyakunengura, Gallery Hall, the oldest sake distillery in Kyushu. Tour of factoy and sake tasting. Then take a short ride to The Asahi Brewery and sample the best beer in Japan. In the evening, visit one of Nakasu's (Fukuoka's Red Light District) Yatai. Here, we eat in one of the outdoor food stalls and experience the true culture of Japan's night life. Day 2: 50-70km. Ride from Fukuoka to Hita. Epic ride through Japan's country side and mountains. (Great way to cure your hangover!!) Check in to Ryokan (Japanese Style Inn) and tour the Sapporo Brewery. Of course, we taste the beer. In the evening, we party it up Japanese style in the small city of Hita. Day 3: 50-60km. Ride from Hita to Yufuin. Nice ride through the mountains to the famous onsen town. Enjoy a natural hot spring bath and local food served up by a family run guest house. In the evening, drink locally made beer, wine and sake. Day 4: 50-60km. Ride from Yufuin to Oita City. Again, epic ride through the mountains and crazy, fun descent to the Pacific Ocean. Oita City's, Miyako Machi area is one of Japan's best places to (Tie One On). Booze, girls and karaoke. Day 5: 20-40km. Tour the nearby city of Beppu. 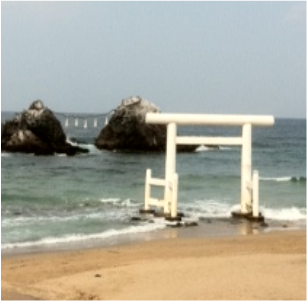 Famous for onsens, mountains, beaches and drinking!! We'll take a midnight train back to Fukuoka and detox. popular cycling areas. This 3 or 5 day tour has the advantage of staying in the same hotel each night at the heart of the big city.